Fantastic Advice on Back Bridging! 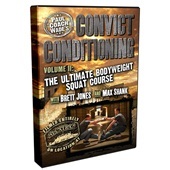 Paul Wade’s Convict Conditioning Volume 4, Advanced Bridging: Forging an Iron Spine explodes out of the cellblock to teach you in absolute detail how to progress from the relative ease of a Short Bridge—to the stunning, “1-in-1,000” achievement of the Stand-to-Stand Bridge. Ten progressive steps guide you to inevitable mastery of this ultimate exercise for an unbreakable back. 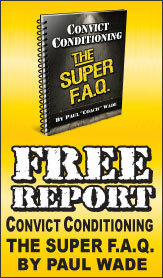 This home-study course in ultimate survival strength comes replete with bonus material not available in Paul Wade’s original Convict Conditioning book—and numerous key training tips that refine and expand on the original program. 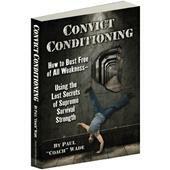 How sure are we that Convict Conditioning, Volume 4: Advanced Bridging: Forging an Iron Spine (DVD) will work for you? 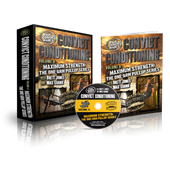 Simply fill out the form below and put Convict Conditioning, Volume 4: Advanced Bridging: Forging an Iron Spine (DVD) to work for you right now. 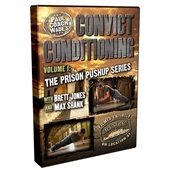 Obviously, we would go out of business if Convict Conditioning, Volume 4: Advanced Bridging: Forging an Iron Spine (DVD) didn't work, the way we said, right? 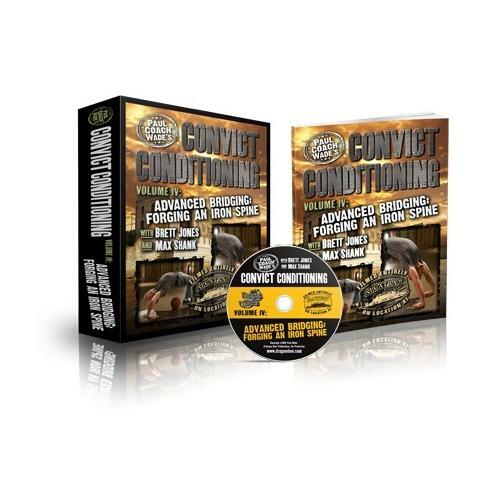 With the promise of a full refund if you're unsatisfied, you have nothing to lose by trying Convict Conditioning, Volume 4: Advanced Bridging: Forging an Iron Spine (DVD). Go ahead and try it today. Filmed entirely—and so appropriately—on "The Rock", Wade’s Convict Conditioning Volume 4, Advanced Bridging: Forging an Iron Spine explodes out of the cellblock to teach you in absolute detail how to progress from the relative ease of a Short Bridge—to the stunning, "1-in-1,000" achievement of the Stand-to-Stand Bridge. Ten progressive steps guide you to inevitable mastery of this ultimate exercise for an unbreakable back. Prowl through the heavily and gorgeously-illustrated 80-plus-page manual and devour the entire film script at your animal leisure. Digest the brilliant, precise photographs and reinforce the raw benefits you absorbed from the DVD. Paul Wade adds a bonus Ten Commandments for Perfect Bridges—which is worth the price of admission alone. And there’s the additional bonus of 4 major Variant drills to add explosivity, fun and super-strength to your core practice. Whatever you are looking for from your bridges—be it supreme suppleness, a tigrishly powerful spine, extreme resilience against injury, or a godlike level of strength-flexibility—it’s yours for the progressive taking with Convict Conditioning Volume 4, Advanced Bridging: Forging an Iron Spine. If you go into any gym, you’ll see lots of guys working hard to train their biceps, their pecs, their lats and so on. But perhaps the most neglected muscles in modern strength training are the muscles of the back—in particular the deep layer of muscles that run up and along the spine. These are the spinal erectors. The spinal column and hips are an essential feature of any body that needs to be strong or athletic. This area is like the universal joint on a motor vehicle. All the pressure of running, punching, lifting and tackling goes straight through the spine—so if you want a body that’s explosive, powerful and as injury-proofed as possible, the best way to get it isn’t through working your "beach muscles" like your biceps or pecs. The best way to toughen up your entire body is by toughening up your spinal column. Previous generations of prison athletes understood the role that the back and spine muscles play in overall toughness. In a way, prison athletes, certainly before the seventies, were lucky when it came to spinal training; they didn’t have access to the kind of distractions that athletes on the outside had. We’re talking about Nautilus back training machines, Cybex machines, hyperextension units or cable machines. Back in the day, convicts didn’t even have weights to train their backs with—no deadlifts, good mornings or cleans. If prisoners wanted to build powerful back muscles, they had to access the more ancient, traditional methods, using bodyweight alone. Luckily for them, the very finest back training techniques are bodyweight exercises—variations of the bridge family of techniques. Bridging is an excellent, ancient approach to building a strong, supple spine—and if you do it properly it’s very safe. A lot of weightlifting for the back involves bending forwards with a heavy weight, and this can cause the discs to pop out, or make muscles rupture or split when the spine is stretched forwards under great pressure. Bridging is different; it involves arching the back. This "locks" the vertebrae into place, prevents subluxation and actually heals old back injuries rather than generating new ones. Prison bridges are different from most approaches because instead of just holding the bridge position, or moving to different positions, the athlete repeats the technique over and over, going up and down and back again—just like you would if you were doing pushups, for example. This approach not only increases flexibility, stamina and tendon strength all at the same time, it also goes a long way towards building muscle. It’s pretty cool to have twin pythons of solid beef running up your spine. And prison-style bridges are also a fantastic workout for the shoulders, arms and legs. Bridging has many benefits. It doesn’t only make your whole body stronger, more supple, and less likely to get injured—bridging will even improve your posture, your digestion, and increase your lung capacity. But most people rarely even train, let alone bend over backwards. So when you begin to tackle bridging, it’s important that you do it gradually. So, we begin with exercises that stimulate the spine and the protective muscles around the hips and back. After some more training to increase shoulder flexibility, we’ll move on to exercises like the classic full bridge. From there, we’ll move to even bigger movements like wall walking and closing bridges. These exercises are constructed in a ten step series that are designed to increase your flexibility, stamina, joint health and total body strength. By the time you reach the tenth step in the series—the Master Step—you’ll be an expert bridger with incredible posterior chain strength and a spine like a steel whip. And your days of bad backs and tight hips will be a thing of the past. Paul Wade gives you ten key points, the "Ten Commandments" of bridging, that will take your prison-style bridge training from just "okay" to absolutely phenomenal. We want the results to be so effective that they’ll literally shock you. This kind of accelerated progress can be achieved, but if you want to achieve it you better listen carefully to these ten key pointers you’ll discover with the DVD. Bodyweight mastery is a lot like high-level martial arts. It’s more about principles than individual techniques. Want a REALLY powerful spine, with dense tendons and thick muscles? Then study and absorb these principles, and you’ll be on your way to a steel-whip spine in no time. Powerful, healthy spinal erectors that are trained to arch well, are worth their weight in gold to any strength athlete. Rated 9/10 Fantastic Advice on Back Bridging!